The LPU series of high current pushbuttons from Dailywell and single or double pole switches with single or double throw operation and momentary or latching action. Designed for higher currents the LPU series is electrically rated up to 15A at 125VAC and 10A at 250VAC with a mechanical life of 10,000 cycles. 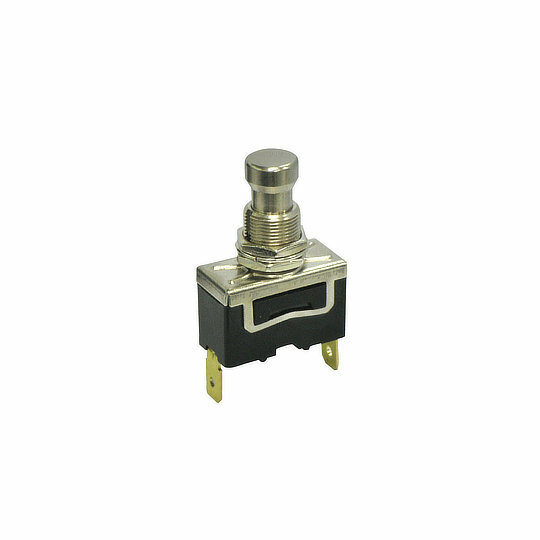 The LPU series of high current pushbuttons from Dailywell and single or double pole switches with single or double throw operation and momentary or latching action. Designed for higher currents the LPU series is electrically rated up to 15A at 125VAC and 10A at 250VAC with a mechanical life of 10,000 cycles. Available with screw or solder lug terminations the single pole models are 14.4mm by 28.9mm with a body depth of 18mm or double pole models are 19.5mm by 31.8mm with a body depth of 20.3mm, all models are designed to fit cut outs of 12mm diameter. The LPU series is perfect for applications such as Industrial Control Systems, Robotic Controls, Automation Systems and Audio Equipment.